It’s the last show of Summer Tour! It’s sad on one level. While I’m definitely ready for a break, I’ve enjoyed this process. I’ve heard some amazing Phish music in the last couple of months. Frankly, I’m a little surprised I made it this far. I missed a couple of shows along the way… I blame SPAC and not myself for that. I made up for missing two 1994 shows by seeing 3 in person that weekend, right? This show is special in so many ways. I happened to be camping in Maine with my buddy Jamie when we decided to hit Sugarbush on our way west… He was ready to get back on Dead Tour for the remainder of the summer. I actually joined him for the Deer Creek run. I managed to score a ticket to the first night… it was the only time I ever got to see Jerry play in person. But this ain’t no Dead blog…. We got to Sugarbush by mid-day and parked at what we soon found out were the lots a few miles from the venue. We piled into a school bus with a bunch of like-minded folks and made our way to the base of the mountain. It was a glorious Vermont day. The view behind the stage was stunning. I can’t imagine a better place to see Phish. 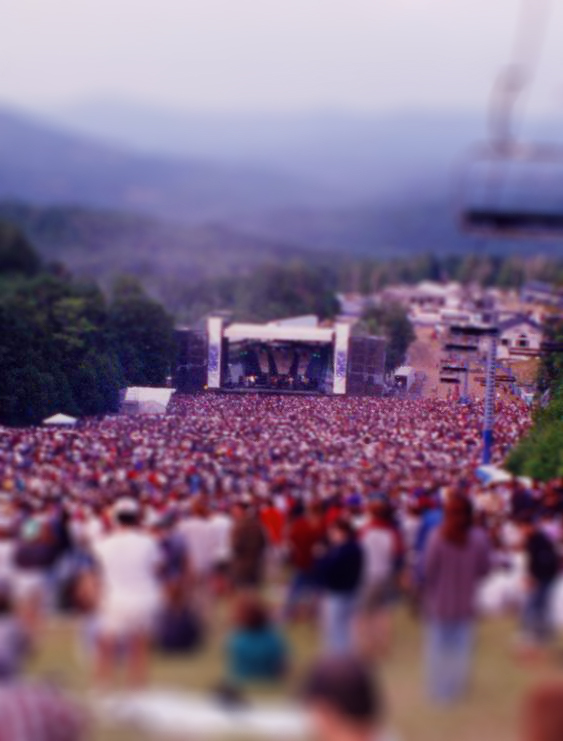 Here’s a pic from the 95 shows that I did not take (though I did “Tilt-Shift” it for fun). The show was nothing short of crazy. It was the first time I was in a Phish crowd that big that was clearly ALL Phish-heads. If there were first-timers at this show, they were well versed. It was the opposite of a newb crowd. No suburban Jersey kids just there for the party, if you know what I mean. Listening now, I’m immediately transported to the scene of the crime. Some kid in front of us actually had a cracker and gave us some NO2 during NO2!! WTF?!?! That’s a pretty uniquely Phishy experience if ever there was one. The whole first set is tight as can be. Great Stash. Perfect Lizards. Energetic Maze. Tough to beat, really. Except that it was completely blown out of water by Set 2. I’ll say this: I was fairly sober at this show, but this Antelope frightened me. I the Catapult is hilarious, of course. But it’s the segment after the Catapult that gets me every time. It’s downright scary! Q: What could they possibly have left in the tank after that set opener? A: I don’t know, but apparently it starts with an Oom Pah Pah!! The Harpua segment is the stuff of legend. 20 years later, it is a fresh as it was that night. The story is just hilarious! The COMET CRASHING INTO JUPITER!! I can’t tell you how many people turned to look up when Trey pointed and said “If you look up there you can probably see it!” as they started up 2001. Fantastic. He had us all in the palm of his hand and he knew it. The rest of the set feels like a victory lap, honestly. The real highlight is the Hood!! An amazingly patient build in this Hood. Sofa King Great! Also, it’s worth noting that Trey is losing his voice by the end of the show and, as such, his vocal on Chalkdust sounds a lot like the vocal track on the Picture of Nectar version. Love it! Getting out of this show was no picnic. We skipped the busses and caught a ride with some kind strangers back to the other parking world. Then we got rear-ended on the way out by some teenagers in a Suburban (so much for for my all-Phish-head crowd theory). They busted the taillight of my trusty Volvo. We settled the score with a hundred bucks cash and let them on their merry way. They were in no shape to deal with insurance or accident reports. I was feeling generous… plus we were prepared to drive through the night through Canada band to Detroit on our way to Deer Creek. So, that’s it!! I can listen to other music for a while now, right? Or at least other eras of Phish? I’m headed to Chicago this weekend for another 3-night run. I cannot freaking wait!! The SPAC shows were stellar. The Randall’s run amazing. Chicago should be off the charts!! As always, thanks for reading! See you on tour! Notes: Golgi was preceded by an a cappella line of Back in My Hometown. Down With Disease was unfinished. NO2 featured Fishman on vacuum. Harpua included a narration about the comet that crashed into Jupiter. Poster got hit by a comet. Antelope included a Simpsons signal and Trey running around the stage with a megaphone. Catapult saw Fishman take a verbal jab at Trey and his upcoming wedding before quickly recanting. Hood contained a Divided Sky tease from Trey and Chalk Dust included a Barracuda tease. This show was officially released as Live Phish 02. It’s Tuesday for me listening to this Friday night show. As I write this, Runaway Jim is playing. That’s the last song of Set 2. The whole show has gone by while my attention has been on busy-work that had to get done. That’s not to say I’ve missed the show. I’ve been listening. I just have not taken any notes at all. This is a great show on a lot of levels. The first ever “Solar-Powered Phish Show! !” Pretty cool. The first “Solar-Powered Vacuum Solo?! ?” I guess that’s something… The first Setting Sail in a long time. You know you’ve been missing that gem of a tune! Seriously, though. There are some great highlights to this one. Set 1 starts out simply enough, but from Divided Sky through the end, it’s fantastic. The Melt, in particular, is serious business. Set 2 opens with Letter to Jimmy Page?!?! Of course, it does. And the Bowie that follows is fantastic. Don’t sleep on the great mid-Set-2 Reba, either. Then the entire Ice->Julius segment is perfect setlist construction. It’s like a mini-set unto itself. Close out with a typical opener?!? Right again! And Sleeping Monkey and Rocky to send ‘em home! One more night left on this tour!! I can’t wait to listen to Sugarbush 94 tomorrow!! Notes: This was the first solar-powered Phish show. Trey sang the verses of Fee through a megaphone. Reba included Brazil and Popeye teases and did not have the whistling ending. Setting Sail was performed for the first time since March 25, 1992 (292 shows). It’s Ice featured a Page-led jam that was unlike most versions. Bowie included a full Jessica tease during the jam. I could not have been more right in my prediction for a great show. Wow. Kudos to all who made it to Randall’s last night. So happy for all of you! Can’t wait for Chicago! Back to the task at hand. This FLPAC show happened 20 years and one day before what could be another epic throwdown by the boys. The only time I’ve ever been to this place was in 95… if you don’t know the Fleezer, you should!! This one starts pretty normal, but don’t let that fool you. The Stash is fantastic even as it fades into a mellow jam that melts right into TMWSIY. You should hear this one! The whole set is tight and solid as hell, if not too crazy. Much like the Melt the night before, this intense ‘lope leaves ‘em wanting more! Set 2 opens with 2001… but instead of huge follow-up like the Melt at Great Woods, they drop into Sample. Boo. Maze saves the day, though, as it’s a barn-burner. If I Could hits a peak you won’t expect. It’s really good! But we’re here for the YEM, right? Yes. The meat and potatoes! First, I’ve gotta comment on Page’s funky little clav breakdown… sounds like 1997 up in here!! That clav is still pretty new to the Phish stage at this point. Page already has the hang of it, though. Love it! Follow it up with a bluesy start to Trey’s solo before it locks into a pattern that whole band is in on. Great stuff. Mike is slap happy throughout Trey’s solo and on into the bass and drums section. Funktastic. Great stuff all around! Cap the whole thing off with another gorgeous Hood. My lord! I really cannot wait for fall tour. 1994 and Harry Hood go together like Apple and Pie!!! And I’m a sucker for Highway to Hell. Great set of music here! Overshadowed by Big Birch? Perhaps. But still really great. Four more shows before I get a huge break from the blog until fall tour… Listening to every show like this has been a task. I’ve enjoyed most of it, but it has taken a lot out of me. I can only imagine how the band feels as they wrap up a tour like this. They’ve gotta feel it. These home-stretch shows start to take on more meaning. They’re playing so well, part of them must not want to stop. But then, they’ve traveled coast-to-coast in a bus with shows almost every night. They’ve got to be exhausted at this point. I’m exhausted just thinking about it. Got it done. It’s 99 degrees out there. I haven’t sweat that much in years!! I am showered and back at my desk now, though. I’m ready for this one!!! Set 2 starts out with a seemingly normal Possum… but the end of the Possum gets, shall we say, “loose?” Mike misses a cue and then the whole thing just falls apart in a pool of band-humor. What happens next just has to be heard to be understood. The Cavern/Wilson thing is pretty crazy. The best part is hearing the crowd doing the “WILSON!” chants in the background. Then they’re all singing along with “Can you still have fun?” and the final choruses of Cavern… they’re right there with the band like this is how it always goes. Awesome!! The NICU that follows is fairly uneventful until the end, too. It fades into this jam that sounds like they’re going into something but they end up in Tweezer which is nothing like the little jam in between. It’s at this point that you really start to understand that this Set 2 is gonna be special throughout…. and it is!! The Tweezer is out there and the segue into Julius sneaks up on you out of nowhere… fantastic!! Listen to THIS Set 2 TODAY… Start to finish… Seriously…wade through all the craziness… Just to get to the Slave!! It’s a beauty!! And you’ve gotta earn this one. Seriously! The build is nuts! Fish just drops the beat completely for a while. Whew! There it is… we’re back in it!! Wow! Serious… Slave… is… serious… MIKE!!! OK… if you’ve really read this far, I am impressed… this is not my finest work of writing… too many “…” throughout… but I really don’t know what else to do. I’m not editing! Today’s journey has been rewarding on its own merit. Notes: Trey sang the verses of Fee through a megaphone. I Didn’t Know featured Fishman on trombone. Wilson was played to the tune of Cavern. Tweezer contained Woody Woodpecker theme, I Wish, and I Know a Little teases. BBFCFM was unfinished and played bluegrass style to the tune of Scent of a Mule. Trey teased Slave throughout Suzy Greenberg. http://www.phishtracks.com/shows/1994-07-13/possum → then seriously just listen through to the end. What else are you doing right now? Nothing that will be as rewarding as listening to this set of music, I guarantee that!!! Alas, there is no 1994 show to listen to today. Instead, I would like to share my review, written two years ago, of my first show. It was not my first rock show (Rush in 1991)… but it was my first “jamband” show. Of course, nobody used the term “jamband” back then. Of course, Spin Doctors were just starting to blow up at this time, too. They had a single (Two Princes) climbing the charts… but in Jersey, we were already very familiar with those guys. We knew they were buddies with Blues Traveler, but I never really thought they were as good. For the record, I still love John Popper. Guy has tremendous talent as a song writer, singer, harp player, guitarist, and is a great guy ta-boot. Anyway, ARU is playing and slowly, one by one, these other musicians are joining them onstage. Then slowly, one by one, the members of ARU are leaving the stage. Before I know it, we are hearing Widespread Panic. Now, people know I’m not the biggest WSP fan, but I gotta admit, this transition was cool. It really set the stage for the rest of the day. This was no normal rock and roll show. Next up was Phish. I had heard some Phish tapes at a few basement parties over the previous few years, but I never really listened too closely. I was definitely unfamiliar and unprepared for this. I will say, the energy in the crowd went up a few notches once Phish hit the stage. Those hippie dudes no longer had their hands in their pockets – they were dancing. Seeing Trey and Mike looking like they were headbanging from the lawn. I mean, you’d have thought they were playing “Master of Puppets” by looking at them, but the music pouring out was Latin jazz. I also remember my attitude towards front-man antics changed a lot that day once I saw a band where all 4 guys were serious musicians. It just made Chris Barron look like an idiot by comparison. It’s funny, because I sing and I love to sing… and I had a few opportunities to sing with bands both in high school and my freshman year of college – but by the time I was in college I really felt like an idiot out front singing… I’m definitely not a “musician” so why would I be in a band. I remember Runaway Jim… I remember Stash just because I loved the way it sounded from the very beginning. It was my first favorite Phish song. I remember Cavern and the vacuum solo. I remember the trampolines and the whole John Popper prank. I was pretty geeked out to think that Popper was going to jam with Phish and a little bummed when he didn’t, but the prank was hilarious. I sort of remember Suzy… then it was over. By the time Blues Traveler hit the stage, the sun had set and the crowd energy had come down quite a bit. I enjoyed their set, which included Warren Haynes (then of the Allman Brothers) sitting in on Mountain Cry. But it was a let-down after Phish. Needless to say, I’ve seen Blues Traveler a couple dozen times since and enjoyed every show, but never have been blown away. I still love John Popper and always will. Since that day I have seen Phish a total of 120 times including this past Sunday in Saratoga Springs, NY. I celebrated my 20 year Phishiversary on Sunday and the boys made it special for me. I caught my first La Grange. They encored with a monster YEM. I spent the weekend with Wendel and his brother (and a bunch of other great folks). Over half of my 120 shows (66 to be exact) I have seen with Wendel. It’s just what we do whenever we can. I wouldn’t have it any other way… Can’t wait to do it again. Notes: This show was part of the H.O.R.D.E. tour that also featured Aquarium Rescue Unit, Blues Traveler, The Spin Doctors and Widespread Panic. Several “official” H.O.R.D.E. dancers took the stage during The Landlady to dance with Trey and Mike. During the tramps segment of YEM, an extra tramp and microphone were brought out for John Popper. On his first jump, though, Popper jumped right through the trampoline. Embarrassed, he left the stage. I love SPAC… I will say it without shame. I love this place. I love that (lately) we get to join in with all our Phish friends and take over the place for a few nights. It’s really tough to beat. That said, there is exactly one place on this earth where I’ve ever gotten into a legitimate shoving match… and it’s happened three times!! All three: SPAC! What it is about this place? The first time I saw Phish at SPAC in 1995 I was shoved unceremoniously out of my seat by a meat-head. I don’t go around calling people meat-heads as a general rule, but how would you best describe a guy who obviously uses steroids and wears a wife-beater to show off his sweet Anheuser-Busch logo tattoo? Meat-head? That’s all I got. Anyway, I was not at this show. It’s a keeper, though, eh? Chalkdust right off the bat features Trey just scorching his ‘doc with all he’s got. Horn>Peaches?? Hellsyeah! Then there’s the Stash. Just a few days after the master-class of Stash performances at Great Woods, we get this intense Set 1 version. Did I say hellsyeah already? This one is nothing like it’s predecessor, too. I mean, it has moments that are just like it, but the locked-in sections bare no resemblance at all. It’s a must hear! Then skip ahead to this Bowie, which is almost Stash-like in intensity. I mean, it scorches from start to finish. Holy smokes!!! This whole Set 2 is great, really, but it’s the Bowie that I come back to. Of course, there’s the great Mike’s and the Dude of Life sit in. But the Bowie! Notes: My Friend included a Purple Haze tease and Julius contained a Buried Alive tease from Trey. Crimes of the Mind featured the Dude of Life on vocals. Night two if this stand must have been a little bit of a letdown. How do you top a Gamehendge show? The short answer is that you don’t. This is a great show, though. It really is. It’s just not as great as the night before. As if to signify the return to normalcy, this one starts out like so many before it with RunJim and Foam. Gumbo is always a treat, and the Maze is typically fierce. The rest of the first set plays out like a first set… Capped with a screaming Antelope. The second set opens with with the infamous 2001->Melt combo that inspired one of my favorite lot tees. Plus the Melt is epic. It gets evil. Then the peak of Fluff must be heard. Fish just relentlessly pounds on the snare until everyone is screaming. Tweezer is high energy. Lifeboy is gorgeous, as usual. And the Hood is nearly perfect. Again, it’s tough to imagine a better show… And had the night before been more run of the mill this would have been the highlight of the week… But alas we had a Gamehendge the night before. It’s really tough to live up to that. I love this second set, though. I’ve heard it so many times over the years and it still holds up. Notes: Antelope contained Call to the Post teases from Trey and Page. I must first admit that this weekend was the first time I faltered from my path. When I set out to listen to 1994 as it happened 20 years later, I thought it would be difficult. I figured I’d miss a few along the way. While I missed posting a few while I traveled to Israel for a wedding a few weeks back, I didn’t skip out on listening. I listened to each show faithfully. Well, my streak has officially ended. I listened to Old Orchard Beach last week on my way to SPAC. It’s an amazing show that my good pal Birdman attended with his kid brother (it was kid brother’s first show!). Birdman committed to write a guest blog post about the show. Instead he let me and all of my readers down by ignoring his assignment. Boo him when you see him next. Then we got to this amazing lakeside cabin which we shared with about 20 Phish-head friends for the SPAC weekend and discovered no WiFi or even cell service!! What a great break from the everyday to not be reachable by cell phone, though!! It was an amazing weekend with great people and great Phish shows. If you missed it, I feel sorry for you. It was that good. But, I faltered. I did not listen to the two Canadian shows. I’m familiar with them. They are amazing shows with crazy bust-outs and great jams. I will try and go back to them this week if I can. In the meantime, I am listening to this classic Great Woods show today! It’s the first of two nights at the first major amphitheater Phish was able to sell out (a year earlier). It’s the last full Gamehendge set the band ever played. I suspect that “ever” to stick around, too, unless they really surprise us with a Gamehendge set for Halloween in Vegas this fall… complete with the Twyla Tharp Dance Troupe?? I’m not sure how NO2 fits into the Gamehendge saga, but it seems to set the tone for this one, doesn’t it? If nothing else, this Gamehendge was a gift for the Northeastern folks who really made Phish a big band. Every Gamehendge before this one was in a small out-of-the-way place like Nectars or Olympia, Washington. The Great Woods Gamehendge set literally tripled the number of Phans who could forever claim to have seen the full saga live. Truly a gift. Unfortunately, I was not at this show. I have not seen a live Gamehendge. I have heard all of them over the years, though. This one seems to be the only one with a crowd that is noticeably (and loudly) into it. The few in the middle all seemed to be played to really attentive and quiet crowds. The 3/22/93 version, in particular, is played to the most attentive Phish crowd I’ve ever heard. This one, though, is played with fire to a crowd on fire! Then there’s the second set… an epic throwdown of a set. I mean it!! This Reba. This Stash. This YEM-Frankenstein sandwich. This Julius. Whew!!! Phish brought the heat! Just for a moment, I’d like to discuss this Stash. If you’ve been reading my blog you know I’ve been sort of counting down to this Stash for the last few weeks. It’s my hands-down favorite version, and perhaps a top-ten-ever jam for me. It’s not that long, but it is so very good. I could keep writing, but this post is long enough… listen to this show today!! Listen to it again another day. Make it part of your regular listening patterns for a while. Get to know it. You’ll find new things to love every time you hear it. Notes: The first set included the complete Gamehendge saga, including narration between songs from N02 through Divided Sky. NO2 featured Fishman on vacuum. Reba contained Manteca teases and did not have the whistling ending. This version of Stash appears on A Live One. Mike teased Frankenstein during the bass and drums segment of YEM. This was the first show by any band that I attended solo. I had a freakin’ blast, too! You’re never really alone at a Phish show, eh? I was in Jersey just for a couple of days. I grew up there, but my folks had moved to Chicago in the spring so I had no home in Jersey anymore. I was just passing through and staying with a friend before taking off on a summer-long journey that would take me coast to coast visiting National Parks and camping all along the way. Unfortunately, my buddy had to work this night so the show was out of the question for him. He rolled up a joint and handed it to me saying, “Head down there solo… make friends with this.” And so I did. When I left his house, the show was not sold out. By the time I got to the lot and walked up to the ticket window it was. So, with a finger in the air I began wandering the lot. An hour later I was starting to get a little concerned. Tickets were scarce! Finally, I ran into 3 kids from my high school who had just graduated… and they recognized me despite having not seen me in 2 years and 15 extra inches of hair… and they had an extra ticket!!! SCORE!! It was a great feeling to walk into the Garden State Arts Center (as it will forever be named in my head). This was the place I first saw Phish two years earlier (HORDE Tour with ARU, WSP, Spin Doctors, and Blues Traveler). This place will forever be special to me. Then Phish played an amazing show! There are literally no low-points. If I could complain about a single thing in this one it would be the Rift encore, but I think they were cutting it close on curfew and they had opened with Golgi, so that was out. I have listened to this show many many times since. It holds up to almost any on this summer tour. Even Set 1 is chock full of highlights. I remember seeing groups of Jewish girls on the lawn dancing and laughing with surprise during the klezmer section of Mule. That gimmick works better in Jersey than, perhaps, anywhere else! Set 1 also features a scorching Divided Sky and a gorgeous Fast Enough for You. The centerpiece, though, is the Tweezer, which builds to a Stash-like tension jam that must be heard and reckoned with. It’s a Tweezer worthy of mid-Set-2 glory. Even better, they close the set out with Tweeprise leaving Set 2 to stand on its own. Perfect. If you’ve never heard Set 2 of this show, you really should. It’s no Bomb Factory, but the Mike’s—>Weekapaug segment is as loose and fun as any Phish you’ll likely hear. By the time they start up McGrupp, the rest of the set feels like a victory lap. Really, they could play anything after that Mike’s and I’d be happy. What they did play was a near-perfect McGrupp, a crazy-high-energy Maze, and a gorgeous Slave. Cap it all off with some AC/DC and I could not be happier!! Seriously, one of my great Phish memories in life. Never be scared to go to a show solo. You’ll never regret it. One last thing: this was the last time I heard I Am Hydrogen live until 12/30/99, a gap of five and a half years and 53 shows (shout out to zzyzx!). Notes: Weekapaug included teases of Antelope (including lyrics) and 2001. The Mann is a funky place. I saw two shows there – both in the summer of 95. I’m actually really happy to know Phish is playing there this summer instead of Camden. I’m not going to the shows, but I’m happy to know they’re happening. Believe it or not, this show is new to me. I attended the next night in New Jersey which overshadowed this one, I guess. It starts out like many before it. Nothing to write home about other than it’s still refreshing to see NICU at home in these summer shows. The first big highlight is the Stash. This one gets dark and crazy, but it’s nowhere near as tight as the Great Woods Stash we’re headed towards. The last little bit of the jam is really, cool, though. Just when they get locked into a groove it quiets down uncharacteristically and Fish plays around on the wood blocks until Trey really quietly brings the thing to a close. And out of that silence we hear the opening notes of Mango. Very cool, indeed. Set 2 starts with a fierce but fairly uneventful Bowie. If I could is beautiful as usual… then Fluffhead anchors the whole thing. It’s not a bad set. Very listenable. Everything is played well and I truly love the setlist, but nothing really stands out here except maybe the Hood. Just a solid Set 2 from a band firing on all cylinders. No complaints! It’s the opening day of Summer Tour 2014!! Have fun out there, folks. I’ll see y’all at SPAC in just a coupla days! Notes: Possum included teases of Voodoo Child (Slight Return).